Israeli officials have long acknowledged their goal to restore formal ties with Mali, though never publicly referred to the status quo of relations in this way. Niger — which is 99 percent Muslim — has so far not been a main focus of Israeli diplomatic outreach, at least not publicly. On Monday evening, Netanyahu addressed the Conference of Presidents of Major American Jewish Organizations’ annual Israel mission in a Jerusalem hotel. During his 30-minute speech, he talked participants through a slide show about Israeli achievements in various fields, including diplomacy. One slide, entitled “Israel is Returning Africa,” showed a map of the continent, dividing its countries into four categories. Colored in red were “Arab countries” with which Israel does not have any formal relations. Countries where Israel has relations but no embassy were shown in light blue, while states where Israel does have an embassy were presented in dark blue. Mali and Niger were colored in beige, which according to the map’s legend indicates that Israel has “potential relations” with them. Somalia and Djibouti, two Muslim-majority states in East Africa, were colored in light blue, implying they have full diplomatic relations with Israel, which they do not. Both the Foreign Ministry and the Prime Minister’s Office declined to respond to written requests for comment. But a senior official, speaking on the condition of anonymity, said that coloring Somalia and Djibouti light-blue was obviously a mistake by whoever prepared the map. “I’ve been in Africa four times in the last two years, that’s gotta tell you something,” Netanyahu said at Monday’s speech to the American-Jewish leaders. “There is a tremendous change… in Israel’s acceptance around the world, by just about every country,” he said. Mali, which is 95 percent Muslim, severed ties with Israel in 1973, following the Yom Kippur War. In June 2017, Netanyahu met President Ibrahim Boubacar Keita at a regional conference in Liberia, where the two leaders “agreed on the warming of relations” between the two countries, the prime minister’s office stated at the time. 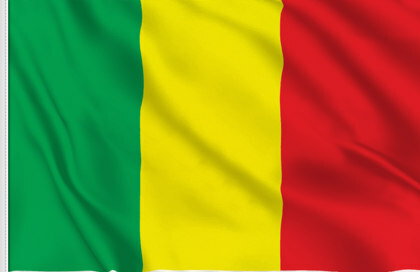 Indeed, Jerusalem was preparing for a visit by Mali’s Prime Minister Soumeylou Boubeye Maiga, Israeli officials said in the aftermath of Netanyahu’s trip to Chad. Maiga will visit Israel “in the coming weeks,” and Netanyahu hopes the trip will take place before the April 9 elections, Hebrew media reported in late January. Niger, which borders both Mali and Chad, severed ties with Israel in 1973, resumed relations in 1996, and cut them again in 2002. In July 2016, Israel renewed diplomatic relations with Guinea, a Muslim-majority country in western Africa.